I’m a big fan of macerated kale salads, it’s something we do at River Cottage quite regularly, and a technique I find brings the humble kale leaf into a new and exciting dimension. What’s more, it’s super quick to put together, because everything is raw. Yes, both the kale and mushrooms are uncooked. I especially love the flavour of uncooked mushrooms. Wash the kale under cold water then shake or spin dry. Tear the leaves from the tougher stalks and place in a bowl. In a small bowl combine the olive oil, the cider vinegar, sugar, garlic and plenty of salt and freshly ground black pepper. Pour this dressing over the kale, and using you hands, massage it into the leaves. Spend 3 – 4 minutes gently massaging away. It will tenderise the leaves, and is an important stage in the recipe. Set aside and wash your hands. Cut the celeriac into very thin matchsticks. This can be done on a board with a sharp knife or with a mandolin if you have one a feel confident about using one. Alternatively you can coarsely grate the celeriac. Remove the stalks from the mushrooms and cut the caps into nice thin slices. 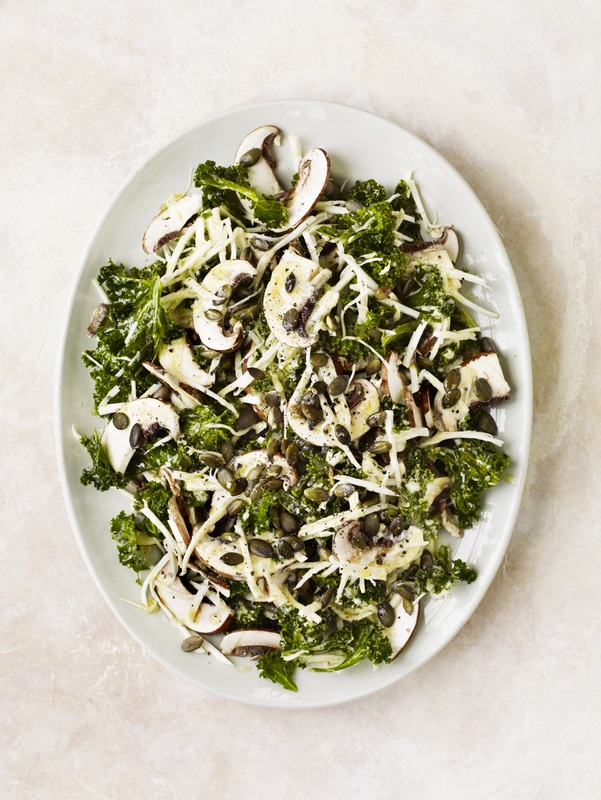 Turn the mushrooms and celeriac through the kale with your hands, tumbling everything together without breaking the mushrooms up too much. Toast the pumpkin seeds in a dry pan, set over a medium heat for 3 – 4 minutes. Spoon the salad out over a large platter. Scatter over the toasted seeds then finish with a trickle of best olive oil, a squeeze of lemon juice and a little more seasoning.